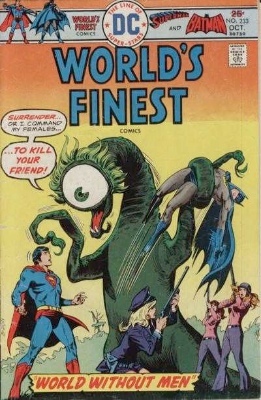 World's Finest Comics #233 Value? I have an issue of World's finest no 233 from October 1975 and would like to know how much it is worth. I have 20 more at home but I'm not sure what issue number they have. Could you please get back to as soon as possible with a price? Editor's reply: Hi Christopher. Thanks for writing in. You didn't include a photo, so I found one for you. World's Finest Comics is strangely not collected very much, and even much earlier issues than yours don't sell very well. The record for this comic book, in CGC 9.6 condition, is only $50! World's Finest Comics #1 is a rare comic book, with big value, but there are plenty that struggle to find a home. No matter how nice yours is, I would not expect it to sell for more than a couple of bucks on eBay. Check values here.